The fracking industry has been condemned by an international tribunal for harming humanity, violating human rights and damaging nature. The Permanent Peoples’ Tribunal, set up in Italy in 1979 to defend human rights, has investigated fracking and issued a preliminary statement accusing companies and governments of failing in their duties. The tribunal took key evidence from Scotland, where the Grangemouth petrochemical giant, Ineos, has taken the Scottish Government to court over its “effective ban” on fracking. A verdict is awaited. The judges described the evidence they heard as consistent, and based on hundreds of independent reports. “The industry has failed to fulfil its legal and moral obligations,” they said. The judges also criticised governments across the world for failing to regulate the industry and protect communities and nature. “They have failed to act promptly and effectively to the dangers of climate change that fracking represents,” they said. The tribunal, which is based in Rome, seeks to uphold the Universal Declaration of Peoples’ Rights agreed in Algiers in 1976. Its main aim “is to contribute to the struggle of peoples for their self-determination and the prevention, assessment, judgment and reparation of their fundamental rights”. One of the lawyers who gave evidence was Lisa Mead, who is based in Moray and director of the Earth Law Alliance, an environmental group. “We gathered and submitted a mass of evidence showing the negative impacts on nature and on human health,” she said. She praised the Scottish Government for extending its moratorium on fracking, and described its approach as “an exemplar” for other countries. “I just wish that the UK government had the sense to follow the same line,” she added. Two experts from the University of Stirling also gave evidence to the tribunal. “The arguments of the UK industry about the alleged safety of fracking do not stand up to scrutiny,” said professor Andrew Watterson, head of the university’s occupational and environmental health research group. Will Dinan, an academic at Stirling University and director of the monitoring group, Spinwatch, accused the industry of a “moral and legal failure”. The Scottish Government was likely “largely excused” from criticism, he said. 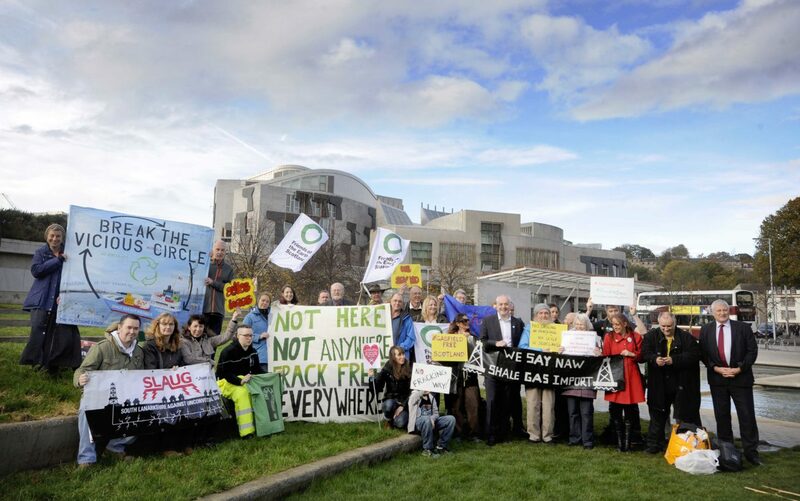 Andy Gheorghiu, policy advisor with the campaign group Food & Water Europe, called on Scottish ministers to reject fracking licences under newly devolved powers. Ineos is demanding multi-million pound compensation from taxpayers for the Scottish Government’s decision not to allow fracking. Lawyers for the government argued in court that a ban had not yet been technically imposed. The Scottish Government stressed that its “preferred position” was not to support the development of unconventional oil and gas. “This position is subject to a strategic environmental assessment,” said a government spokesperson. UK Onshore Oil and Gas (UKOOG), which represents fracking companies, highlighted a 2014 report by a Scottish Government panel of experts. It concluded that Scotland’s regulatory system was “sufficiently robust” to manage fracking, according to UKOOG’s chief executive, Ken Cronin. Ineos did not respond to requests to comment. Photo thanks to Friends of the Earth Scotland and Colin Hattersley. A version of this story was published in the Sunday Herald on 10 June 2018.